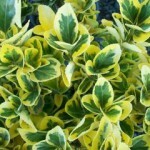 A fast growing shrub with lustrous dark green leaves that are edged with bright yellow. The habit is dense and upright. It is adaptable to various soils and is quite salt tolerant. It will withstand heavy pruning. 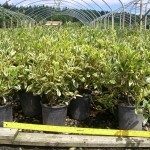 Use as a hedge, in the shrub border, or for screening.